Four suspects are wanted after a burglary at a Manchester, New Hampshire camera shop that left the store with $50,000 in losses. 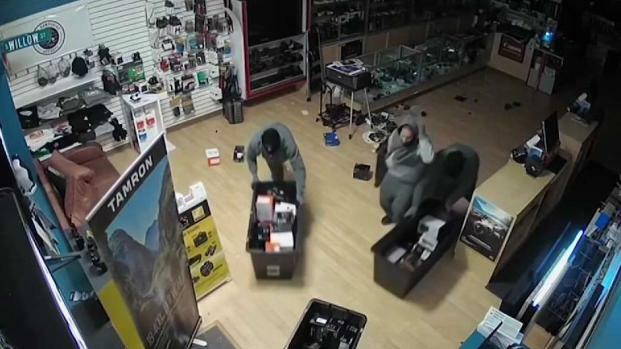 In Manchester, New Hampshire, four thieves smashed a glass door at a video equipment store and stormed in like mad men with their own buckets. “They busted through it and they just kind of shimmied through like a big doggy door,” said store manager Harper Hodges. The burglars used an axe to break the glass at Hunt’s Photo and Video just before 5 a.m. Thursday. They moved quickly, cleaning out about $50,000 worth of cameras and lenses before running out the front door. They did it all in 53 seconds. 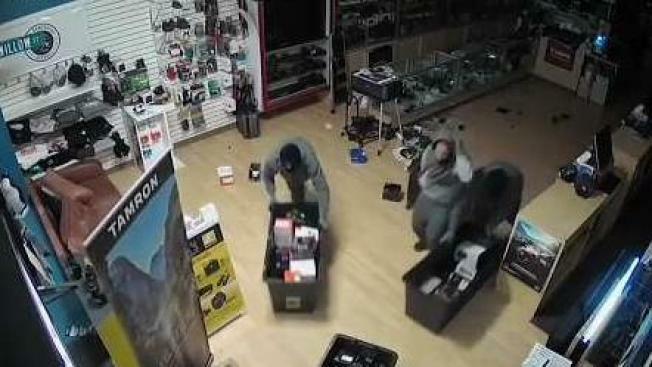 Burglars in Machester, New Hampshire used an axe to break into a video equipment store. A high-end surveillance video camera caught it all. A high-end surveillance camera, right above the front doors, rolled on their every move. Hodges installed it after a similar break-in four months ago. Now Manchester police have the video, and they’re using it to try to track down the suspects. Hodges said he believes the two break-ins might be related. The store’s now out about $100,000.